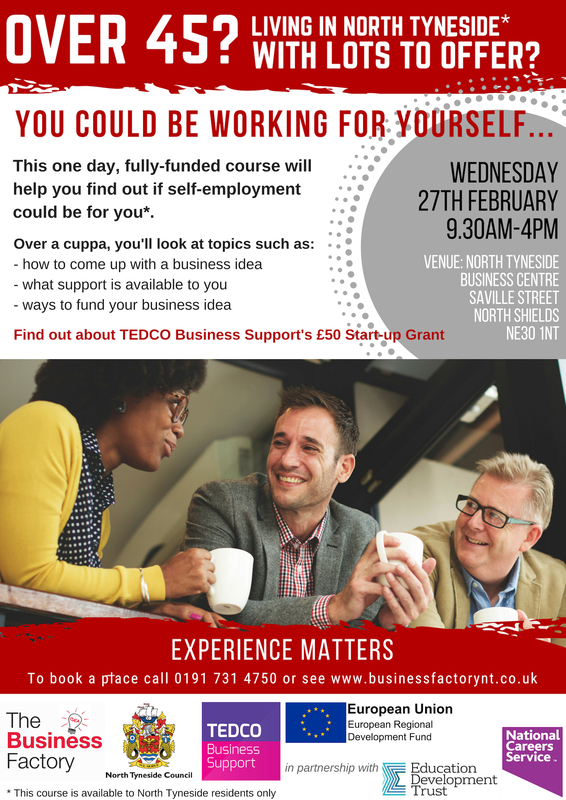 This one day, fully-funded workshop will help you find out if self-employment could be for you. Perhaps you’ve already had a career and been made redundant, you may have spent time taking care of an elderly relative; whatever your reason for seeking a new challenge, this easy-going enterprise course could open up new opportunities for you. Delivered by Janice Ross (embracing the Over 45 bracket!) for North Tyneside Council’s start-up service, The Business Factory, the workshop is supported by Education Development Trust who run the National Careers Service and Fuller Working Live programmes in the area. *This course is open to North Tyneside businesses and residents only due to the funding criteria.